TruGreen Professional LawnCare, one of the world’s largest lawn care franchises has welcomed two new franchisees to the network after a fantastic start to 2018. 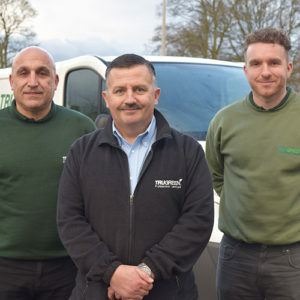 George Michaela and Mike Simmonds have launched TruGreen West Midlands and TruGreen Gloucestershire, respectively, just in time for the spring and key grass growing season. All new TruGreen franchise investors undertake intensive training at the ServiceMaster Franchise Support Centre under the tutelage of TruGreen brand operations manager and former Wembley head groundsman, Steve Welch and the wider ServiceMaster franchise support team. As part of the training, George and Mike achieved their City & Guilds NPTC Level 2 Award in the Safe Use of Pesticides (PA1 and PA6), which allows them to provide a professional, accredited and safe service to customers. ServiceMaster has over 300 franchisees operating in close to 700 licensed areas under its brands, including Merry Maids, ServiceMaster Clean, Furniture Medic, TruGreen Professional LawnCare and Rosemary Bookkeeping. TruGreen has been recognised as a leading franchise opportunity in the Elite Franchise Top 100 franchises in the United Kingdom and will exhibit at the upcoming National Franchise Exhibition at the NEC in Birmingham on 16th and 17th February. TruGreen named in top 100 franchises in the UK TruGreen North East joins the network!